Are you debating purchasing an electric toothbrush, and stuck between whether or not to opt for the Philips Sonicare DiamondClean or a Philips Flexcare toothbrush, however you aren’t quite sure about the differences between the two electric toothbrushes and ultimately, whether or not the DiamondClean is worth the extra expense? Well if so, this comparison guide will be able to help you out through their specific differences and the features they have in common. Then, ultimately you can decide on which Sonicare toothbrush you should consider, the DiamondClean or the Flexcare plus. If you have braces, you might find our review of the best Oral B toothbrushes for braces. Although a relatively minor difference, it is evident from the look of the two toothbrushes, they have a slightly different look to them. Where the FlexCare + has a dark gray/silver base with the cleaning modes being all visible whereas the DiamondClean (comes in either black or white) but has an invisible LED cleaning mode system, where the readings fade. Although the images don’t do it all that much justice, the DiamondClean does look pretty smart and modern (to the extent it has achieved multiple Design Awards). Sensitive Mode provides for a gentle cleaning mode for sensitive teeth, and the Philips Sonicare DiamondClean takes it one step further with a sensitive cleaning mode for ‘gums’ as well (apart from the HX6972 model Flexcare Plus where it comes with the additional gum care mode as well as a massage mode for gums that the Diamond Clean is absent of). Removes More Plaque – the Diamond Clean model (which is both the HX9332 and HX9352) are the best ‘whitening’ toothbrushes in the entire Sonicare range where they are proven to remove up to 7 times more plaque than a manual toothbrush (more so than any other electric toothbrush on the market). This is the main distinctive factor that separates the Sonicare Diamondclean from the Flexcare toothbrushes. UV Sanitizer – the Philips Sonicare DiamondClean doesn’t come with the cleaning sanitizer like some of the Sonicare Flexcare range does, which acts to kill 99% of germs & bacteria collected after you have cleaned with it.  Dual Charge System – although the Diamond Clean instead comes with a ‘glass’ that is able to charge your electric toothbrush as well as coming with a luxury travel case. What Aspects Remain Somewhat the Same? 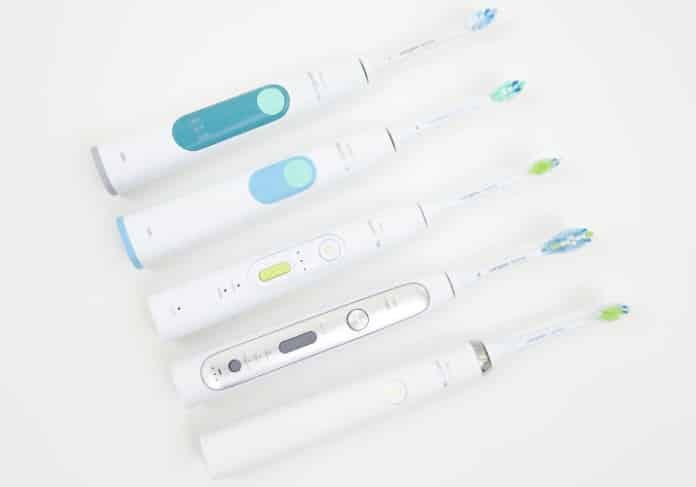 Apart from the above five factors, they are largely the same electric toothbrush that offers with five specific cleaning modes, which although they have slightly different names, ultimately do a very similar job. The standard clean mode, the gum care mode as well as a ‘sensitive’ cleaning and where they differ slightly is that the Diamond Clean has ‘white’ and ‘polish’ whereas the Flexcare Plus has massage and refresh. Everything else is pretty much identical, they both have a battery life of around 3 weeks, they come with an integrated professional timer system (and a quad pacer) and perform around 30,000 brush strokes per minute. Moreover, when it is the Sonicare DiamondClean Vs Flexcare platinum even more aspects remain the same, the only difference that occurs there is that the DiamondClean comes with more cleaning modes (the Platinum offers just ‘clean’, ‘gum care’ and ‘white’) and can be charged in a glass (as mentioned). However, the Sonicare Flexcare platinum comes with a pressure sensor via vibrations, to ensure you aren’t brushing too hard where you could be potentially removing the healthy enamel from your teeth and also comes with the UV sanitizer that was mentioned above. Which Should You Buy the FlexCare or Diamond Clean? Although they do a very similar job they specialize in slightly different areas. The DiamondClean is essentially for being extremely effective in removing plaque and for you to get ‘whiter teeth’ (twice as effective as standard electric toothbrushes) whereas the flexcare specializes more in maintaining healthy gums (although the Diamond clean does this to a very decent extent as well). With consideration of all the above factors as well it is clear the DiamondClean is the better model and we believe more than justifies the extra $30 or so difference between the two.